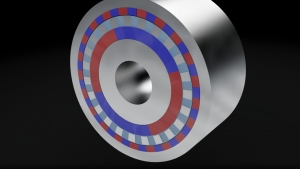 Magnetic components are the norm in electric motors and non-contact drive couplings, but new developments could see magnets taking the place of mechanical gears in power transmission systems. Paul Stevens reports on novel magnet-based power transmission components and the advantages they offer designers. 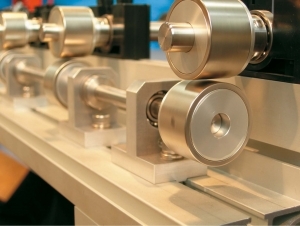 Transmissions, couplings and dampers, as well as electrical machines and actuators, are well catered for by existing technologies, yet these technologies all have their limitations and drawbacks. Gears, for example, require lubrication, generate noise and suffer from inherent friction that reduces their mechanical inefficiency. Magnetism, which is used in everything from toys and door catches to electric motors and medical imaging systems, is the subject of ongoing research by commercial organisations and academic institutions. Improved field strengths and design techniques mean that smaller and lighter magnets can replace larger composite magnets or create new opportunities. One of the academic institutions that has been leading the research is the University of Sheffield in the UK. Magnomatics was established as a spin-out company from Sheffield University in 2006 to commercialise groundbreaking research on magnetic transmission systems, high-torque electrical machines and electromechanical actuators and dampers. This work was being undertaken by Dr Kais Atallah and Professor David Howe in the Electrical Machines and Drives laboratories at the University. Today Magnomatics maintains strong links with the University, making use of the available technical expertise and research facilities. Members of Dr Atallah's original research group now form the core of Magnomatics' technical team. Magnomatics' activities centre on - but are not restricted to - magnetic gearing, in which components transmit torque by non-contact magnetic coupling rather than meshed mechanical gear teeth. Depending on the embodiment, Magnomatics says that gear ratios from 1.01:1 to 1000:1 are possible. Dr Atallah invented and demonstrated a high-torque magnetic gear in 2001. Compared with mechanical gears, his invention is claimed to offer advantages including reduced maintenance, improved reliability, no need for lubricants, higher efficiency, precise peak torque transmission, inherent overload protection, reduced drivetrain pulsations, tolerance of misalignment and low noise. In some applications, it is also beneficial that the input and output shafts are physically isolated. Magnomatics' magnetic gears use permanent magnets to transmit torque between an input and output shaft. The company says that torque densities comparable with mechanical gears can be achieved with an efficiency of 99 per cent or better at full load and much higher efficiencies in part-load conditions than mechanical gears can achieve. Furthermore, for higher power ratings a magnetic gear can be smaller, lighter and cost less than a mechanical gear. Since there is no contact between the moving parts, there is no wear and no need for lubrication (Fig.1). Magnetic gears also protect against overloads by slipping harmlessly if an excessive torque is applied, and automatically and safely re-engaging when the excess torque is removed. The low-ratio magnetic gear uses a series of steel pole-pieces to modulate the fields produced by two permanent magnet rotors with different numbers of magnetic poles. In this arrangement the magnet arrays rotate at different speeds, with the gear ratio determined by the ratio of magnets in each array. The transfer of motion between input and output shafts is achieved passively using powerful permanent magnets and an intermediate modulating element (Fig.2). A high degree of magnetic coupling between the rotors allows for torque densities to be realised that are comparable with mechanical gears. Gear ratios of 50:1 down to 1.01:1 with almost zero torque ripple are readily achievable. Interestingly, low-ratio magnetic gears can be realised in a conventional radial field or in an axial arrangement when a thin 'pancake' design is required (Fig.3). Magnomatics' low-ratio magnetic gear forms an integral component within the company's new type of permanent magnet machine, the pseudo direct drive (PDD), that offers a far higher torque density than conventional motor-gearbox combinations (see below). Magnomatics high-ratio magnetic gears use a rotating diverging air gap to modulate the fields produced by the permanent magnet arrays on the input and output rotors. As with the low-ratio gears, a high degree of coupling between the rotors allows for a very high torque density to be achieved. The simple and robust structure of the high-ratio magnetic gear enables ratios of up to 1000:1 to be achieved in a single co-axial stage. This system therefore provides an elegant, friction-free alternative to complex, high-cost, multi-stage mechanical gears. Unlike conventional mechanical systems, the versatility of the magnetic gear concept allows a linear variant to be realised with very high force density. The linear variant is fully reversible and can be used either as a stroke amplifier or as a force amplifier to suit the target application - which could be as diverse as a flow control valve actuator, telescopic robotic arm or direct-drive wave power generation system. This magnetic gear topology is said to be well suited to actuation systems that might otherwise rely on inefficient rotary-to-linear conversion technologies such as ball or lead screws; it is also attracting interest as a potential replacement for hydraulic actuators. If required, the linear gearing can be combined with a brushless permanent-magnet linear motor to create a linear pseudo direct drive actuator with ultra-high force density. While linear non-contact 'geared' transmissions are one step away from rotary non-contact 'gears,' a little lateral thinking soon reveals other possibilities. One such development that Magnomatics has been working on is a magnetic, non-contact, continuously variable transmission (CVT) or infinitely variable transmission (IVT) offering a controllable ratio and power transfer. The magnetic CVT is highly efficient and compact, requires no cooling or lubrication and is suitable for applications as diverse as hybrid vehicles and wind turbines. Solving the tribological challenges inherent in most CVT designs can prove difficult, so a non-contact concept certainly sounds very attractive. Often a machine design requires a motor to drive a load either directly or via a gearbox. Magnomatics has therefore developed a unit that combines a low-ratio magnetic gear with a permanent-magnet motor. Known as the pseudo-direct drive (PDD) machine, this development is said to offer a torque density that is several times greater than is possible when using a high-performance permanent-magnet motor with a conventional gearbox (Fig.4). Advantages of the PDD machine - unveilled in 2005 - include a significant size and weight reduction over conventional direct-drive machines, simplified machine design due to the ultra-high efficiency eliminating the need for ancillary cooling, and reduced maintenance and improved reliability compared with mechanically geared drives (Fig.5). Conventional electrical machines can only achieve a relatively low torque output due to the limits on magnetic and electrical stresses that can be used. For compact systems, mechanical gearing is often required to match a high-speed, low-torque machine to its lower-speed, higher-torque load - which introduces the need for lubrication, cooling, servicing and the potential for catastrophic failure and jamming on overload. Potential applications for the PDD machine range from hybrid vehicle drives to direct-drive utility-scale wind turbine and marine propulsion systems. Magnomatics says the PDD machine could be configured in radial-field, axial-field and linear topologies. The PDD machine is undoubtedly an exciting product, but there are other magnet-based products that, while being less exciting, still solve particular engineering problems in an elegant way. Magnomatics says it has the expertise and modelling capabilities to address these as well. For example, magnetic couplings can transmit torque from one system to another while maintaining a hermetic seal to prevent leakage and contamination. The couplings are synchronous (output shaft speed is exactly equal to input speed) and such coupling can be designed with a maximum 100 per cent mechanical efficiency. Magnetic couplings are widely used with pumps to isolate the electrical motor from the liquid and eliminate dynamic seals that have a finite lifetime and are prone to leakage; instead, a membrane or seal wall is located in the magnetic gap between the rotors. Similar in some respects to magnetic couplings, eddy current or induction couplings act as a torque-limiting power transmission element to prevent drive train failure under excessive loads. The couplings are robust and, when optimised for the application, can be very efficient. If required, the torque profile can be tailored to provide the ability to connect shafts rotating at different speeds and safely re-engage the drive without introducing drive train shock loads. The devices can be purely passive with permanent magnet excitation, or active with wound field excitation; this allows the load capacity to be controlled and the systems to be rapidly de-coupled. Each set of application requirements results in a different design, wherein the torque speed profile and efficiency are balanced against the manufacturing complexity and system cost. Magnomatics has designed a wide range of transmission couplings for areas such as high-performance weight-optimised aerospace applications, robust high-shock industrial drives and standby power generation systems. The company's extensive modelling capabilities enable eddy current coupling designs to be optimised in terms of torque-speed characteristics, losses, dynamic behaviour and thermal effects in order to achieve the most compact package for the given operating conditions. A close relative of magnet-based gears and couplings, eddy current dampers enable aerospace customers to meet the demanding requirements of applications such as landing gear and flight control surface actuation for more-electric aircraft. Eddy current dampers also find applications in vibration isolation for structures, engine mounts for high-performance vehicles, force-feedback devices and industrial motion control.